If you're new to fly fishing, Joe Petralia's book will be of great help! There have been many books and articles written for those who are interested in learning how to fly fish. Some are pretty good while others seem to only add confusion to beginners who already are faced with learning about equipment and gear that has its own unique purposes along with terminology that can seem daunting at first. Even the skill of casting a fly line can be intimidating at first to the person who has learned to cast the weight of a lure with spin or bait casting rods, and the concepts of casting a relatively weightless fly tied with feather and fur can be confusing. I am often asked by those who want to learn the skills necessary to become proficient fly anglers if there are any good books available. I am always hesitant to recommend a book, regardless how good it may be, because the skill of casting is one which must be practiced and not simply read about in a book. Often, reading a book can lead to more confusion and taking lessons from a proficient fly caster will be beneficial when the instructor can immediately see and help the student correct bad habits that will impinge on becoming proficient. As well, having an instructor nearby has advantages in providing confidence that the student will be able to develop the skills in a short period of time as the instructor provides gentle correction and technique demonstration. I recently discovered a book which I will have no hesitation in recommending to anyone who wants to learn by reading. I would still recommend that anyone who does wish to learn also seek out good instruction, but Flyfishing: First Cast To First Fish by Joseph F. Petralia will certainly make a great companion to any professional instruction. According to the publishing company's (Sierra Outdoor Products Co.,) webpage, Petralia has spent his life exploring, prospecting, and fly fishing throughout the United States. The web page shows an image of the author which could easily be mistaken for a 19th century gold panner if it wasn't in color. Images aside, Petralia certainly knows fly fishing and his experience in instructing and guiding others is evident while reading Flyfishing. There is really nothing that Petralia has left out. He has included sections on choosing tackle and equipment, descriptions of basic casting techniques, some excellent instruction on how to 'read water', and a helpful section on resources, knot tying and identifying fish. Throughout, there are helpful diagrams and photographs which assist in showing the reader what is meant throughout the text. The author has left nothing to the imagination like some instructional books and he often draws upon his own experiences and provides these real life examples as another method to ensure the reader learns in a practical manner. 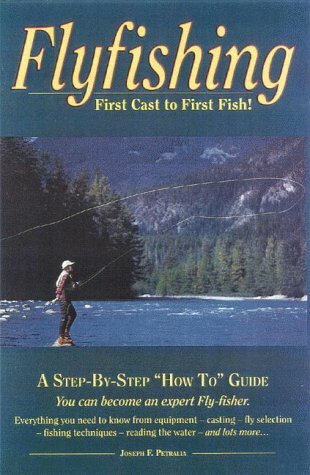 Most fly fishing instructional books concentrate on fly casting and the catching of fish. This book is no exception, but one of the things I really liked about the book was that Petralia also included a section on fly tying. Although it is very basic, and the section only numbers about 5 pages, Petralia was able to cover fly tying equipment and basic tying methods. After this book, the reader should have a good idea of what fly fishing is all about, and may even be able to catch fish on flies tied by him or herself. Again, I am of the opinion that the best way to learn fly fishing is to take lessons from an accomplished fly angler. However, this book will certainly be a wonderful companion for the beginner. I highly recommend it to anyone who wants to learn more about flyfishing. I think I am going to put it on a few of my acquaintances Christmas lists!